So, I just couldn’t stop at the Asparagus Vase! 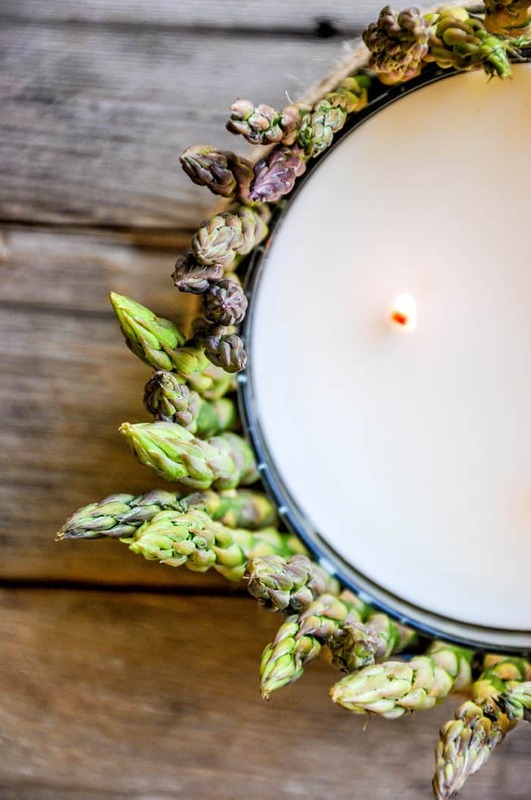 I thought about what else I could cover in beautiful, fresh asparagus and the natural answer would be candles! The asparagus spears bring an organic and architectural element to my decor. Plus, it works indoors or outdoors! Perfect for Spring dinners out on the deck, this eye-pleasing idea will keep all your guests captivated. To ensure the spears don’t get too hot, just make sure your filled candles are at least 3″ in diameter. Mine never even got a little hot. Ready to try? It’s super easy! Measure one spear up against the side of the candle to test the height. I kept mine a good 2″ above the rim of the candle. Secure with a rubber band. Once you have settled on a good spear height, cut all your spears to the same length. Using a long piece of twine, wrap the twine near the rubber band and overlap several times to cover. Tie a knot to secure and cut the twine tails, or you can even tie a bow. To keep the candles ultra fresh, store the candles int he refrigerator until ready to display. Make a few more and enjoy this naturally beautiful candle arrangement at your next evening under the stars.